The program gave me the opportunity to understand how much of a bubble we live in in the United States. Being an economic world power has a tendency to have everything be accomodated to us. One aspect of my experience in Scandinavian countries that gave me this inclination is that fact that everyone in these countries speaks their native language in addition to english. This is a common trend around the world except for the United States, and makes traveling abroad for many citizens more difficult. This has a tendency to close us off from the rest of the world and makes us appear closed-minded. In my STEP internship, I assisted Local Matters’ Culinary Medicine Program Manager and Executive Chef to research the best practices for developing Local Matters’ own Culinary Medicine Education (CME) curriculum. I shadowed the program manager and medical students in the culinary medicine program to provide feedback on program structure. I also engaged health systems like Boston University Medical Center and Geisinger, and nonprofits similar to Local Matters, like Wholesome Wave, to discuss food prescription program implementation and program health outcomes. I collected fact sheets and information from these organizations and synthesized them into annotated bibliographies to accelerate CME program development. Prior to doing this project, I had a preconceived notion of valuing the role of lifestyle, particularly healthy diets and exercise, as being integral to setting the foundation to a healthy, enjoyable life. However, I did not know the degree to which this concept could be implemented and the extent of its effect. Learning that food can actually be versatile enough to be used as medicine was an eye opening concept in itself. Then, learning that institutions, such as Boston University Medical Center, are actually implementing programs around food prescription provided insight into the current state of progressivism in medicine. It is promising to see a shift away from the more strictly traditional means of medicine, particularly away from pharmaceutical emphasis, and more towards holistic, preventative care. This is what I hoped to see while doing this project, and I definitely saw this change occurring. However, on the flip side, this project made me question the potential of this as a practice. I started to question whether food had a place in medicine, or whether it should simply remain in its own somewhat separate but still similar sect- perhaps medical dietetics as it is now. Limitations may exist with food as medicine, as food right now is restricted to limited therapeutic ability, and focused more on preventative care. Perhaps this could be a direction for genetic modification to travel to engineer food to have more potent “curative” powers, such as to aid in genetic diseases. There is also the barrier of ideology and self gain with these health systems that are implementing the programs. Unfortunately I got an impression, particularly from the private health system Geisinger, that this type of prescription program was as much of a PR move as it was a genuine effort to assist patients in a novel, sustainable health oriented way. I was definitely moved by the amount of physicians that were on board with the movement of investigating food as a means of medicine. During my research, I encountered a good amount of health systems that had experimented with food prescription programs given the novel nature of this concept. I particularly remember interacting with a group of physicians from Nationwide Children’s Hospital who seriously were interested in the research behind these programs. They are a part of the future foundation of preventative care as not just a pharmaceutical driven field, but more of a patient focused field. This is particularly relevant to me as I look to go into medicine, and want to see, especially coming from a personal training background and as a person who has valued the pursuit of health, a shift towards valuing preventative care more. The experience that got me thinking about the limits of the therapeutic part of food prescription was shadowing the culinary medicine program each weekly class during the fall and spring semester. It seemed that with each diet they tried, everything was lifestyle disease focused, such as the DASH diet focused on controlling sodium intake for hypertension. There was the occasional deficiency fixing oriented diet, such as higher iron diets combating anemia due to low iron, or even working around a condition like phenylketonuria. Yet, most focus was on lifestyle. This is not to say that lifestyle oriented health does not need a focus, but rather that this is a limited approach. I hope to see research work in tandem, such as the research being done at Nationwide Children’s Hospital that I sat in on, with culinary medicine related programs to make food even more versatile, and add a new element to the realm of preventative care. Another aspect of my skepticism was in the attitude of the culinary medicine program participants (Ohio State and Ohio University Medical Students) I saw while shadowing the classes. Whether it was due to the nature of the class, or their own demeanor, they seemed uninterested and detached from the significance of the class. Sure, they could recognize the potential of food, particularly the science behind why certain foods have certain beneficial physiological effects, in health. However, they tended to neglect overarching themes of why these programs are implemented, that is for the patients, such as for patients to take more control over their lives and develop a greater understanding of how to incorporate healthy practices, while not having to take a financial hit. This experience as a whole has grown my perspective on the medical field. I went in with an open mind, and came out with a bank of knowledge and reflection. I not only saw what exists in the way of culinary medicine and prescribing food, and its current state in the medical and pharmaceutical industries, but also was able to ponder whether it should play a larger role in medicine. If it should, how? Experiences and reflections oriented around these themes are pertinent to my life as I look to become a physician. This experience helped me see the expansion of the medical field, potential resistance to expansion, and subsequently how much more the field may have to go to enact institutional changes. 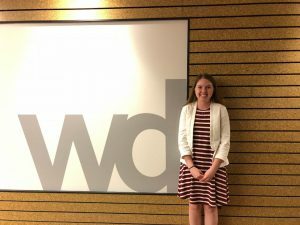 In my spring semester of 2018, I interned with WD Partners in Dublin, Ohio, as an Associate Mechanical Designer. I worked on a team of Mechanical, Electrical, and Civil Engineers, and Architects to design HVAC and Plumbing Systems for commercial buildings such as restaurants, coffee shops, and grocery stores all over the United States. Throughout my internship, I utilized new computer aided design software, contacted local building departments to acquire information about codes and project specific requirements, conducted heat load calculations, sized roof top units, and drafted construction documents. Completing this STEP signature project affirmed my passion for mechanical engineering, created a space for me to grow as a professional, and allowed me to develop a better understanding of the commercial construction industry. Before starting my internship, I made it my goal to determine whether a career in this industry would be worthy to pursue upon graduation. I found that I really enjoy the HVAC and Plumbing aspects of mechanical engineering, and this opportunity has allowed me to develop a clearer direction for my education as I move forward with my career at Ohio State. While interning, I developed important relationships with the engineers and architects within WD Partners and other companies as well, expanding my professional network, and improving my professional communication skills in the process. Overall, I learned valuable engineering design and computer skills, grew as a professional engineer, and gained a better understanding of the design process and commercial HVAC and Plumbing industry. On a day to day basis, my main task was to assist mechanical engineers in designing plumbing and HVAC systems. At first, I spent the majority of my time picking up redlines (edits) from other engineers, allowing me to improve my computer aided design skills and to learn more about the design process. As my computer aided design skills improved, WD Partners gave me more responsibility and opportunities to produce my own designs! 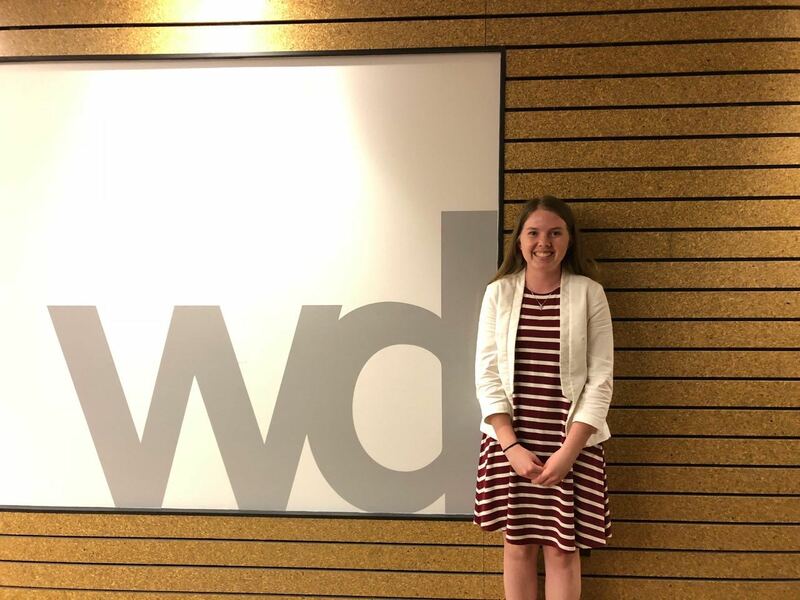 While taking on more responsibility within my job at WD Partners, I have learned more than I could have imagined and am excited to continue the training and work with the company as I continue my education. One difficult task that I was given was to research state and city building codes and to contact local jurisdictions to determine requirements for project specific equipment such as grease interceptors. This task was difficult for me because I was not good at effectively communicating over the phone and dreaded the idea of making phone calls. However, through lots of practice and some direction from coworkers who were well versed in the matters, I was able to overcome my fear of making phone calls and became more efficient at determining the requirements for our different projects! Through this process, I eventually came to enjoy calling local building departments and improved my professional email skills as well. One exciting opportunity that WD Partners had provided for me was to be involved in one of their future projects through going on a site survey visit. During this opportunity, I learned the important things to observe in an existing building from a mechanical engineering perspective while also remembering the architectural, civil, and electrical components as well. That experience was vital to my understanding of the work that I got to do with WD because it gave me a larger perspective and better understanding of the engineering design process from the very beginning and showed me the importance of communicating with other engineering disciplines throughout the design process. Overall, my time interning with WD Partners was an amazing and transformational experience. When looking back on this semester, I am able to see how my professional skills have greatly improved and my love and excitement for the HVAC Industry has increased as well. When considering my future career, I imagine myself working at a consulting engineering firm such as WD Partners because of everything that this experience has taught me. However, a dream of mine would also be to use my knowledge and skills to serve third world nations by aiding in the design of hospitals or plumbing systems. I am passionate about serving others and would love to combine my passion for engineering with my faith by serving in an area that could use my skills. Overall, I enjoyed my time at WD Partners because it has lead me to become a better engineer and given me the skills and desires to pursue my dreams and to become the best mechanical engineer that I can be. 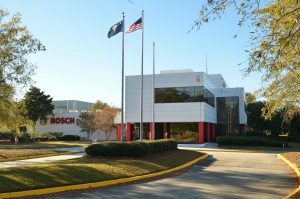 My STEP signature project entailed working at the Robert Bosch Charleston Plant in Charleston, South Carolina, serving as an industrial engineering co-op. In this role, I aided in the day to day projects and duties of a full time Industrial Engineer. I was able to be a part of many projects that had direct impacts on the company and product group I was a part of. I felt that I gained a lot of insight about myself during my time in South Carolina. One of the largest transformations that took place during my time was moving to a completely new area without knowing anyone that I would be around. I lived and worked with individuals that I had never met for one of the first times in my life. I was forced to be put into an uncomfortable situation where I did not have much knowledge of the people or the work I was a part of. The other major change that occurred during my STEP project was getting the first professional experience in my possible field of work. This experience was completely unlike what I was expecting, and I believe I now have a better understanding of where I may want my future to go. One of the major reasons that I was hoping to take a co-op was to have an opportunity to live somewhere else in the United States, even if it was only for a short stint. I was able to work and live on my own outside of a school setting for the first time. Rather than having a strict day to day schedule, I could do whatever I pleased after my work day. I took this opportunity to explore a new city and really soak in a different environment other than what Ohio had to offer. This is something that I felt was really valuable about my experience. The other major insight I gained through this project was the opportunity to gain experience in what I may do in my future after school. With no real expectation of what I would be doing, I felt that I learned so much in my short time at Bosch. Initially I was worried that the work I was going to be offered would be nothing more than tedious day to day tasks. I felt that they wouldn’t offer large opportunities to an individual with little to experience in a professional environment. Luckily, I was provided with much more than busy work. When I first began working, I received minor tasks that I felt did not have any real impact. I worked hard through these tasks and received positive feedback on the work I was doing. As my term continued, my supervisor began to give me more and more impactful projects. I began to become less dependent on my supervisor for guidance and started to completely own the work I was given. By the end of my time, I was at the head of several projects that were providing large savings to the company. I believed that even as a first term co-op, I was providing value which allowed me to see that I could really thrive in this field. I believe that as a whole, my STEP project helped me both personally and professionally. For the first time I was able to live and experience a new location with no real agenda. I was also able to gain experience in a role that I may hope to one day be my career path. Overall this experience has gave me a clearer view of my future goals of moving to a new location in a job that I will enjoy. For my STEP project I took the second semester of my junior year off in order to co-op with a Columbus robotics company, Rimrock Corporation. While technically a mechanical engineering internship, I did a fair amount of electrical work and computer programming. 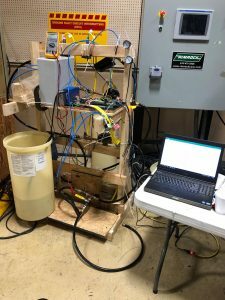 My primary project was building a nozzle test stand that would automatically cycle through four parameters to test our E-Nozzle product. The project required design in SOLIDWORKS, mechanical assembly and plumbing, and computer programming in Arduino and Python. I was able to experience many different facets of engineering during the project which gave me a great experience to take with me going forward. Coming into college, I did not have much of a practical engineering background. 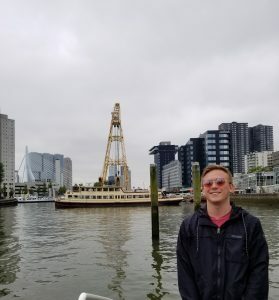 This internship exposed me to a variety of real aspects of engineering as well as gave me a better understanding of how mechanical systems work in general. This project gave me the experience to better understand what I want to do with my career and what to look for in my first job. I found this important because it will put me on a track to make good decisions going forward. During the first part of the project I was the only intern with the company. Thus I did a lot of interacting with the older engineers. This exposed me to a lot of timeless wisdom that is only attained via trial and error for many years. What I found particularly interesting was that while technology may have changed drastically over the past 30 years, the engineering mindset of how to go about solving problems has not changed at all and is the same thinking process we are learning now. I also had the opportunity to interact with a lot of the shop floor workers during my internship. These were guys who did not have college educations, but were very wise and extremely knowledgeable. Coming from a family where everyone went to college, it was very interesting to get the prospective of people who did not come from that background. Hard work, doing things the right way, and letting people know when they are doing something wrong are strong tenants of those guys and were great things to pick up. Towards the end of my internship, two other interns joined me, Troy and Sam. They were both a year older than me and did a great job of showing me the ropes of working at the company and getting acquainted with some of the more in depth things about the company. We were also able to bounce ideas off of each other which was great to be able to do. As I stated above, the main things I gained from this internship were experience and perspective. The fact that I was able to get this exposure relatively early in my engineering career, I think will be something that a really appreciate going forward. The ability to see things as they actually are will be extremely valuable for future decisions that I have to make in engineering and otherwise.